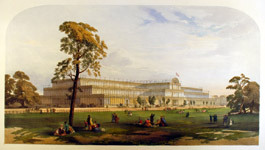 The Building was erected in London's Hyde Park to house the Great Exhibition. It occupied an area of about 19 acres when built. After the Exhibition was announced some 245 designs were submitted to the Building Committee, but none of them proved acceptable. Amid a welter of controversy Joseph Paxton publicly proposed his own spectacular glass palace by appealing over the heads of the Building Committee - printing his design for a "Crystal Palace" in the Illustrated London News. Contractors took over the site in Hyde Park at the end of July 1850 and construction started in August, and was eventually completed by 1st May 1851.
maximum breadth of 456 feet), with 3 entrances, and 17 exits. The height of the nave was 63 feet, and the height of the transept was 108 feet. It was so tall that three large elm trees were left to grow inside the building. Altogether 4,500 tons of iron and 600,000 cubic feet of timber were used in construction, and the building was finished with 293,655 panes of glass.